Wayne Gangi spent the weekend putting the lingerie-clad mannequins back in place outside his Clifton office. He also added some male mannequins after hearing complaints that his previous display only included women. 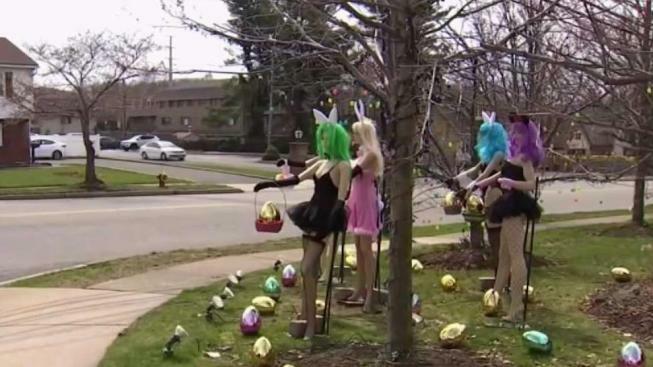 The initial display featured five mannequins dressed in lingerie, all holding Easter baskets and surrounded by Easter eggs. It had drawn mixed reviews from neighbors, as well as passersby who stopped to take photos. A news crew was filming the display last week when 37-year-old Desiree Mozek took it down with some garden shears. Mozek, who has been charged with criminal mischief, says she didn't want her 16-year-old son to be subjected to the "disgusting" display. She told News 4 she wasn't the least bit sorry for destroying the scene, saying she readily admitted as much to police when they questioned her about it. “I think I did something right,” Mozek told News 4.